Scott Sommerdorf | The Salt Lake Tribune Cole Urmann, foreground, switched to Salt Lake Arts Academy because the fifth-grade classes at his old school, Wasatch Elementary, were too large. 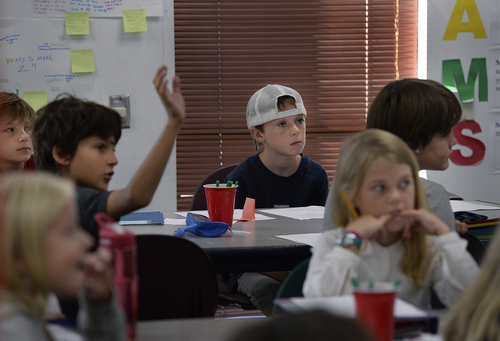 Here he participates in Dan Armstrong's Math5 class at Salt Lake Arts Academy, Wednesday, September 10, 2014. | Courtesy Photo A Jordan District teacher said one year she started the year with more 50 students, so as a joke her students built ìdouble decker desks.î One student sat on top and another on the bottom, kind of like bunk beds. Scott Sommerdorf | The Salt Lake Tribune Cole Urmann, foreground, switched to Salt Lake Arts Academy because the fifth-grade classes at his old school, Wasatch Elementary, were too large. 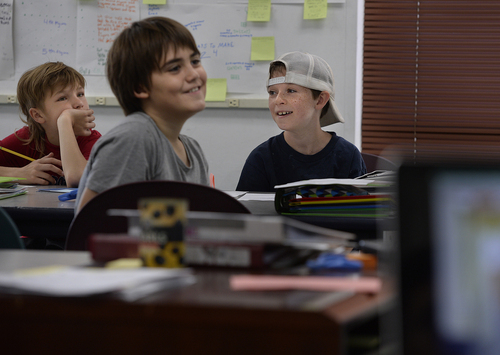 Here he participates in Dan Armstrong's Math5 class at Salt Lake Arts Academy, Wednesday, September 10, 2014. Scott Sommerdorf | The Salt Lake Tribune Cole Urmann, right, switched to Salt Lake Arts Academy because the fifth-grade classes at his old school, Wasatch Elementary, were too large. Here he participates in Dan Armstrong's Math5 class at Salt Lake Arts Academy, Wednesday, September 10, 2014. 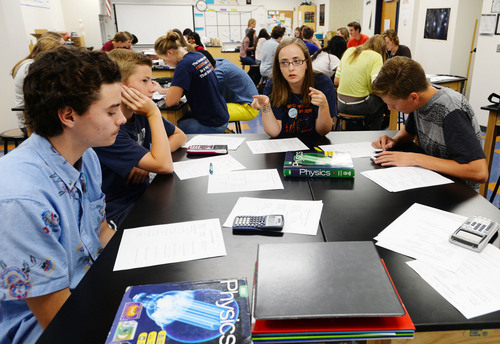 Steve Griffin | The Salt Lake Tribune Sarah Carlson,works with her physics students during class at Brighton High School in Cottonwood Heights, Utah Friday, August 22, 2014. More Utah teachers are flipping their classrooms -- having kids learn via technology at home and then do their "homework" during class with help from the teacher. Scott Sommerdorf | The Salt Lake Tribune Cole Urmann, center, switched to Salt Lake Arts Academy because the fifth-grade classes at his old school, Wasatch Elementary, were too large. 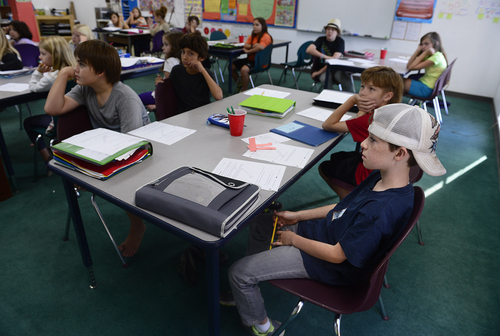 Here he participates in Dan Armstrong's Math5 class at Salt Lake Arts Academy, Wednesday, September 10, 2014. Scott Sommerdorf | The Salt Lake Tribune Cole Urmann, center, switched to Salt Lake Arts Academy because the fifth-grade classes at his old school, Wasatch Elementary, were too large. Here he participates in Dan Armstrong's Math5 class at Salt Lake Arts Academy, Wednesday, September 10, 2014. When Cole Urmann and his parents learned how large his fifth-grade class would be, they made a major decision. They decided to switch schools this year, leaving Salt Lake City&apos;s Wasatch Elementary for the Salt Lake Arts Academy so Cole wouldn&apos;t be one of more than 37 kids in the classroom. "The extra-large, supersize class size was kind of the tipping point for us," said Cole&apos;s Dad, Daniel Urmann. "To me, that&apos;s way too big. I think it just becomes less teaching and more kind of organizing and disciplining at that point." Utah has long had some of the largest class sizes in the country, with a student-to-teacher ratio of 22.8 to one in 2011, according to the National Center for Education Statistics. That, however, is merely an average, and in reality, many Utah classes are much bigger. LIVE CHAT: At 12:15 p.m. Monday, join Utah education experts and Tribune staffers to discuss what it would take to reduce class sizes. The Tribune asked readers last week to help us find the state&apos;s largest classes. The Tribune received more than 100 responses via email, Facebook and Twitter  mostly from teachers. One teacher in the Granite district said she had 52 students in her Utah Studies class for seventh-graders last year. A parent reported 43 students in her son&apos;s Granite district honors English class last year. A Canyons foreign language teacher said she now has 42 students in one of her classes. A Logan School District teacher reported 56 students in one of her classes. "The classes of 40 and 38 are frequently interrupted with management and behavioral issues, not enough computers in the same lab, etc.," wrote Shelly Edmonds, a teacher at Hillcrest High, who noted she has one class with 40 kids this year. Hillcrest High Advanced Placement Literature teacher Katie Bullock said she has 39 kids in one class and 100 AP Literature students overall. "Try grading the amount of writing that takes place every week in an AP Lit course (or should take place … which doesn&apos;t … because I can&apos;t humanly keep up …)," she wrote. 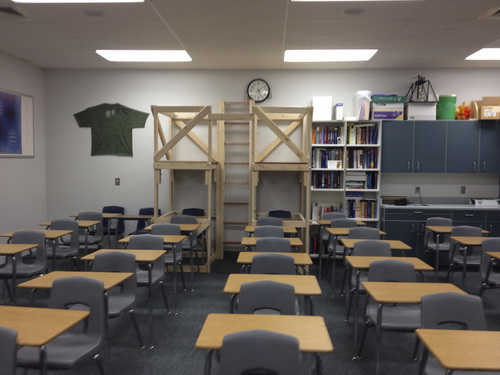 Yet another Jordan district teacher said she once started the school year with more 50 students, so as a joke her students built "double decker desks." One student sat on top and another on the bottom, like bunk beds. "There is no doubt that my instruction would be more geared to individual students and I would have time for more specialized instruction if only my classes (and my student population overall) were lower," wrote Whitney Lee, a language arts teacher at Draper Park Middle School who teaches at least one honors class of 37 this year. Generally, Utah&apos;s large class sizes can be blamed on relatively low per-pupil funding (Utah has the lowest per-pupil spending in the nation), and lots of kids. The state has long given Utah schools extra dollars to help with class sizes, but that money hasn&apos;t usually been enough to shrink them to levels many parents and teachers would prefer. Plus, the importance of smaller class sizes is not something on which everyone in Utah agrees. Some feel that lowering class sizes might not make as big of a difference academically as other strategies and programs. "Class size is really irrelevant in this day and age in education," said Judi Clark, executive director of Parents for Choice in Education. "It&apos;s not about how many children you have in the classroom. 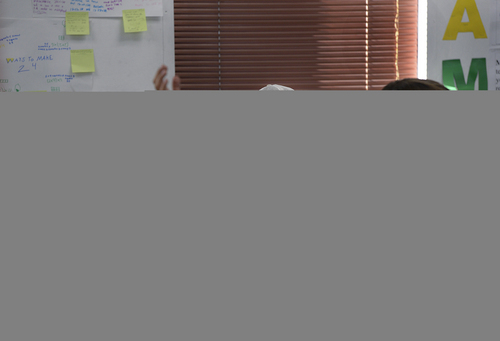 It&apos;s about how you&apos;re leveraging technology to deliver one-on-one instruction." Senate President Wayne Niederhauser said he&apos;s sure class size matters, but the legislative Education Task Force, which he co-chairs, has not yet discussed the issue. "There are a lot of things that affect student outcomes, and class size probably does have an effect but there are a lot of other factors that play into it," Niederhauser said. "So I think you&apos;ve got to look at all the factors as a whole and see which one gets us the most bang for the dollar and pursue those issues, and if that&apos;s class size then we&apos;re going to have to maybe look at it." Plus, some say, Utah would potentially have to lower class size dramatically to see any results. A landmark study conducted in Tennessee in the 1980s found that K-3 classes of 13 to 17 students outperformed classes of 22 to 26 students. A Utah Office of Education analysis in 2011 found that schools that met federal testing goals tended to have lower class sizes than those that didn&apos;t  though that correlation doesn&apos;t necessarily mean smaller classes led directly to the higher scores. Debra Andrews, principal at Wasatch Elementary, said this year&apos;s fifth-grade classes are unusually large, with 34 in one and 37 in the other. She said she doesn&apos;t know why the school got so many fifth-graders this year. She said teachers and school leaders have discussed ways to ease the situation, including the idea of creating a combined classroom of fifth- and sixth-graders, but teachers worried that would affect instruction. They ultimately decided to hire a teacher&apos;s aide to help out in the fifth-grade classrooms, a move that must be approved by the school&apos;s community council. The Salt Lake City School District put money this year toward lowering class sizes, and one goal was to drop the size of fourth- through sixth-grade classes by more than two students, to 28 kids per class. But that&apos;s just a goal, and some schools wind up with smaller classes and others larger ones. Andrews said she thinks whether large class sizes affect instruction depends on the teacher. "I think you have some teachers that are some very good managers of not only the students&apos; instruction but time and it doesn&apos;t impact instruction or curriculum," Andrews said. But Daniel Urmann said when class sizes start approaching 40, "to me, that&apos;s way too big." He said his son always loved Wasatch Elementary, and never had problems with bloated class sizes until this year. So far, Cole is enjoying his time at the Salt Lake Arts Academy, a charter school, his father said. Unlike traditional public schools, charters can limit their enrollment and can sometimes have flexibility when it comes to certain staffing issues, often meaning lower class sizes. O Utah schools are known for their large class sizes, but what difference do numbers make for students and teachers? How does quantity in the classroom affect learning? On Monday at 12:15 p.m., Utah Education Policy Center director Andrea Rorrer, Utah State University education professor Laura Foley and Tribune reporter Lisa Schencker join Jennifer Napier-Pearce to talk about the research and what it would take to reduce class sizes. Watch this online video chat at sltrib.com. You can also join the discussion by sending questions and comments to the hashtag #TribTalk on Twitter and Google+ or texting 801-609-8059.